Real-Time Bidding is the latest addition to the digital lexicon.RTB goes beyond traditional forms of advertising, it is the exchange of ad inventory on the platform is on an impression-by-impressio/n basis. The thing about us marketers is that every new-thing-on-the-block becomes part of our everyday vocabulary. Real-Time Bidding is the latest addition to the digital lexicon. But if asked what Real-Time Bidding is, blank stares are usually the answers. 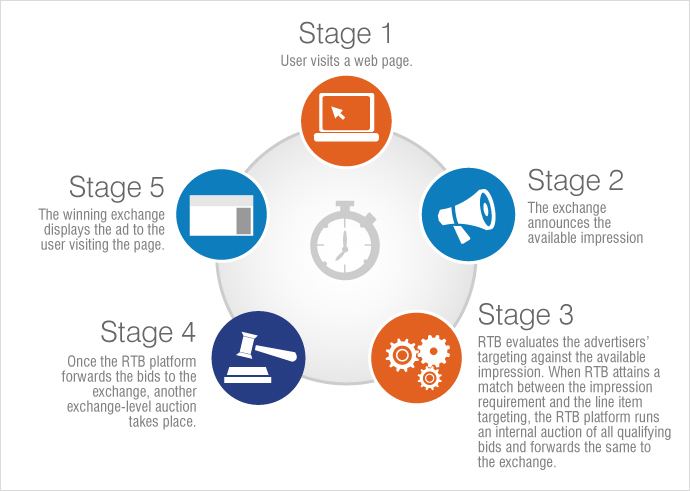 Here you will find a detailed explanation about what Real-Time Bidding is, and how useful the tool is to a digital marketer. Real-Time Bidding (RTB) is a technology that Demand-side Platforms use to determine which impressions are most relevant to users when they visit a web page. This is based on targeting data such as location, demographics, and more. RTB represents the process of evaluating and bidding online for an ad impression in real time. Here real time means the mere seconds it takes for a webpage to load. Yes, it is that instantaneous. Due to the instantaneous nature of the process, RTB has become analogous to the Stock Exchange. What Types Of Creatives Are Compatible In Real-Time Bidding? 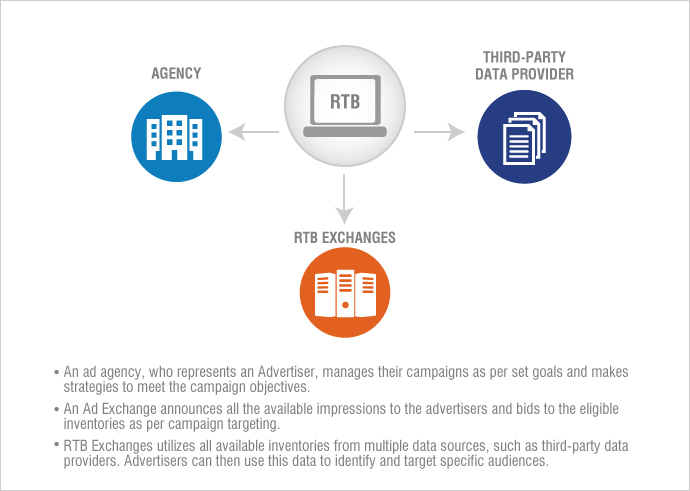 What Are The Types of Ad Exchanges Available In Real-Time Bidding? RTB offers a digital marketer access to a host of top-tier inventory across screens and formats, and the real-time insights to measure the success of the buy. The prominent inventories available on RTB include Double Click Exchange, Right Media, Rubicon, AppNexus, Pubmatic, ContextWeb, Casale, and OpenX. What Are The Types of Targeting Options Available In Real-Time Bidding? As a digital marketer, RTB helps one understand the audience with real-time data and uniform insights. RTB offers unified and open platform that allows a digital marketer to shape and segregate audience data from multiple sources. So, why is Real-Time Bidding good for advertisers? RTB gives you a host of inventories across a range of sites. These inventories which can be easily accessed with the help of ad exchanges. While at the same enabling the adviser to handpick only those impressions that they deem valuable. This also ensures that the brand being advertised gets better exposure and reach the right audience. What is the future of Real-Time Bidding? The varied possibilities that RTB presents has propelled it as one of the most preferred modes of digital advertising. In the last few years, RTB has been embraced by digital marketers across the globe and RTB is expected to grow further in the next few years. According to a report published by the International Data Corporation the RTB spends is expected to reach 20.8 Billion by 2017. As Real-Time Bidding continues to grow, the chances of gaining valuable insights regarding the audience will continue to grow as well. For an advertiser, RTB’s impression-by-impression mode allows them to execute better strategies with regards to customer segmentation while staying within the budget. For a digital marketer, the seamless interaction between the campaign, site, and user information ensures a higher success ratio. Keeping all these things in mind, one can say with certainty that the addition of RTB into our ever-changing digital environment isn’t fleeting matter; RTB is here to stay and is testament of the dynamic and exhilarating future that digital advertising industry will have!